The effects of information technology (IT) and computation developments on prison classification productivity are examined (p. vi). 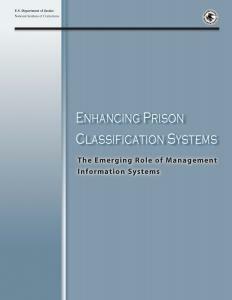 Ten chapters follow an executive summary: current status of MIS (management information system) support for prison classification brief review; MIS software, IT and classification productivity; offender classification roles and data requirements; automated prison classification system features and functions; software design principles and the user interface; evaluating classification MIS; integrating criminal justice system MISs; new directions in classification factors and information content; advances in analytical capacities of IT to strengthen prison classification; and implementing new technology and managing change. Appendixes contain general inmate processing procedures for Department of Correction(s) (or Correctional Services) in Washington, Florida, New Jersey, North Carolina, South Carolina, New York, and Colorado.